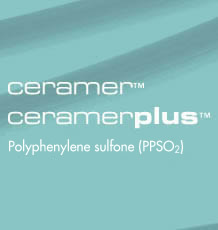 The Ceramer productline was developed by Hoechst AG and introduced into the market in 1998 by Ticona (since 2013 Celanese). The manufacturing process on industrial scale is well-established. Ceramer products have a broad application spectrum in the polymer and coating industry as well as semi-finished parts. In order to fully develop the market potential in all application areas and to further explore new application possibilities, in May 2003 Ceramer GmbH was founded jointly by Ticona, Prof. Hans-Werner Schmidt, Chair of Macromolecular Chemistry at the University of Bayreuth and Nikolaus Helbig, responsible for financial and legal issues. Various patents on Ceramer and Ceramer products have been granted in Europe, USA and Asia. The patents cover the material itself , the manufacturing process, compounds with Ceramer and applications. The rights are kept and maintained by Ticona. Ceramer GmbH has an exclusive license under these patents. Ceramer GmbH is located within the newly established Competence Center for New Materials in Bayreuth, Germany. The combination of scientific expertise in polymers and of non-injection moldable materials and the possibilities in the Competence Center in conjunction with the excellent research facilities in the University of Bayreuth are a profound base to fully develop the market potential of this outstanding high performance polymer material.